The EPR Series is a paddlewheel type flowmeter that measures the velocity of flowing fluid in a pipe and calculates the flowrate in fluid volume per unit of time, such as gpm (gallons per minute) or l/m (liters per minute). The EPR includes the primary sensing element and can also include the transmitter to provide an analog electrical signal to a remote readout or control system. The EPR is a lightweight and compact design that allows the user to carry, install and operate it conveniently. 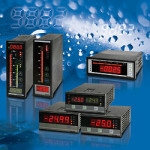 PB/PM Series is a product line of panel meters including bargraph and/or digital displays. A variety of input types are available, including 2-wire analog input (transmitter power supply included as standard). 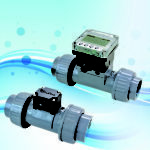 These panel meters are cost-effective, packed full of features and easy to install and setup. EF/MEF Series are by-pass level transmitter product lines, more commonly know as magnetic level gauge devices that can be equipped for local visual indication only or with level switches and an electronic level transmitter output. 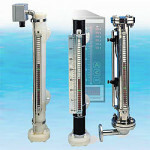 The magnetic level gauge units include their own self-contained chamber that would be mounted to the vessel, typically via side connections at the top and bottom areas of the EF/MEF by-pass chamber. The EF is standard size and MEF is a smaller “mini” version. These magnetic level gauge units are safer than glass gauges that they typically replace.